A spacious b&b super king double en suite (pictured right) – en suite shower, basin, and WC. 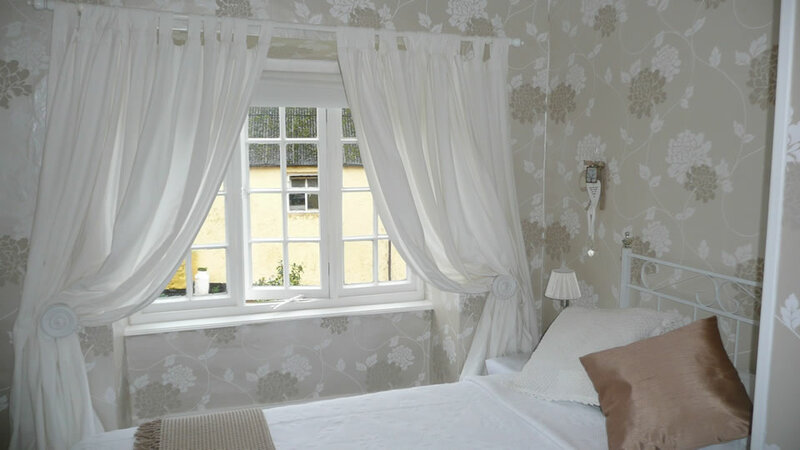 The room is decorated with Laura Ashley beige and white colours with hints of soft gold & cream. Views from the window look over the farmhouse garden, farm, and fields. The room has original dark wood flooring partly covered with soft rugs, and large and extensive cupboards & shelving for storage. Features an original large open fireplace (not for use). An electric kettle and cups are also supplied on a small table. Together all 3 bedrooms with sitting room are ideal for friends or family stays – please bring own wine & drinks, landing fridge available, no charges are made. 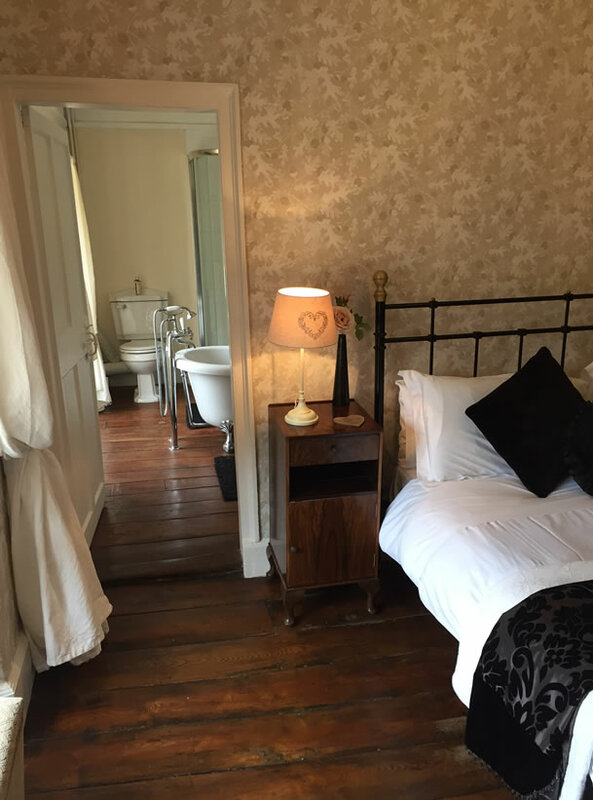 This is an ample sized B&B ‘king double’ room (pictured right), with en-suite luxury bathroom – roll top slipper bath, toilet, basin, & shower. Both rooms have original dark wood floors with rugs & stylish decor incorporating neutral cream & white, with touches of black, silver & chocolate. Features original fireplace (not for use). There is a large mahogany wardrobe with shelving for storage, also a dressing table. An electric kettle with cups are supplied for guest use on a small table. Views from the windows look over the farmhouse garden, farm and fields. There is a fridge on the landing that may be used by the guests to keep wine or drinks & snacks cool. 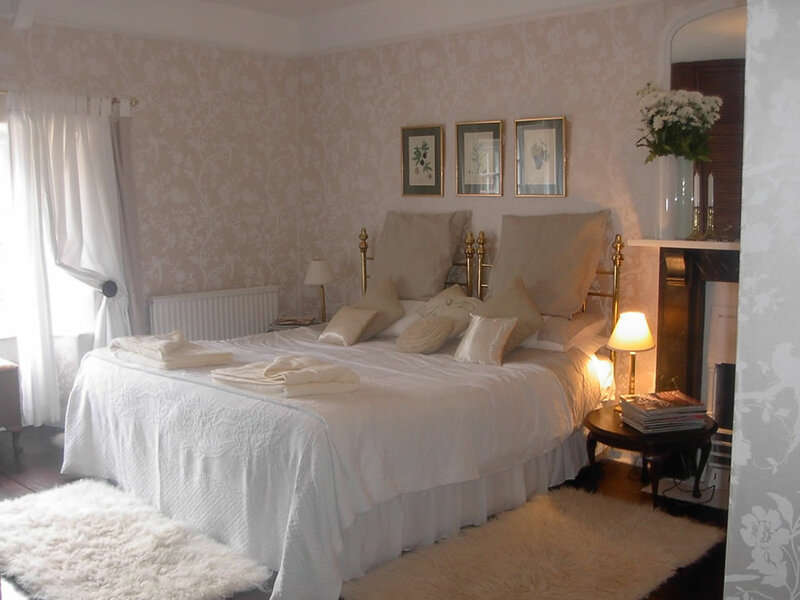 A long b&b twin room (pictured right) with views over the farmhouse garden and surrounding fields. The room contains two comfy single beds, with one situated at the window and the other by the door. The decor is composed of Laura Ashley soft beige & white paper with matching carpeted floor. There is a wardrobe and chest of drawers for storage. An electric kettle and cups are also supplied for guest use. There is a private bathroom next door with large antique roll top bath + shower, sink and toilet. This room combined with the Oak king double make an ideal family/friends group of 3 rooms incl private bathroom. There is also a separate guests toilet on the landing. There is a fridge on the landing which may also be used by guests.